As one of the country's leading IRA and Pension Consulting and Service firms, we offer the financial services industry a complete package of IRA and Pension Forms and Support. We promote the interest of the financial institution while at the same time providing a clear explanation of IRAs or HSAs to the individual. Box 4. Recharacterized Contributions. The IRSinstructions are very brief, “Enter any amounts recharacterized plus earnings from one type of IRA to another.” If a person had made either an annual contribution or a conversion contribution to a Roth IRA in either 2011 and/or 2012, he or she may elect to recharacterize it as adjusted by earnings or losses to be traditional IRA contribution in 2012. The total amount recharacterized is to be reported in box 4. Although the IRS instructions use the term, “plus earnings”, the IRS should use the term, “plus or minus earnings or losses. Boxes 12a (RMD date) and 12b (RMD Amount). An IRA custodian’s use of these two boxes is optional, it is not mandatory. Under current IRS procedures, the IRS does not require the traditional IRA custodian to furnish it with the RMD amount. The law is unsettled whether or not the IRS has the legal authority to require that an IRA custodian furnish the RMD amount. Since the IRS would like to be furnished this information, the IRS has added boxes 12a and 12b to the Form 5498. The approach adopted by the IRS is that a traditional IRA custodian by completing boxes 11, 12a and 12b on the Form 5498 and furnishing it to the IRA accountholder will meet the requirement that it must furnish a RMD Notice by January 31. The IRS instructions do permit the IRA custodian to furnish a separate Form 5498 with the only information being furnished is the information for boxes 11, 12a and 12. Duty To Prepare/Furnish Corrected Form 5498. An IRA custodian is required to prepare a corrected form 5498 as soon as possible after it learns there is an error on the original form as filed. 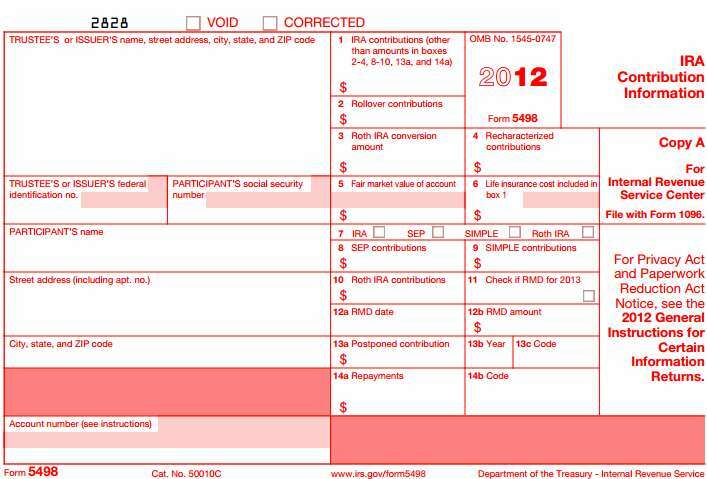 The IRS furnishes the following example. “If you reported as rollover contributions in box 2, and you later discover that part of the contribution was not eligible to be rolled over and was, therefore, a regular contribution that should have been reported in box 1 (even if the amount exceeds the regular contribution limit), you must file a corrected For 5498.